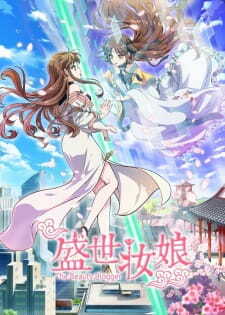 An adaptation of a Chinese web novel written by Li Xiao (荔箫). It is a great Anime. I am rewatching it again. I just upset that it finished in episode 20. I wanted to watch more. it has a good sense of romance, it also has its love for makeup out characters are also very good looking and cute. And I am into romances and princes. Amazingly this anime has both the romance and the prince. It is just soo.... good. For me at least but I would recommend others to watch it I mean you never know when you might like it because at first, I thought that this anime was not meant for me. and now look at me I am madly in love with it. Story (5/10): If you are looking for a detailed and in-depth plot, you aren't going to find it here. While the premise is interesting a few episodes in, the quality of the plot decreases near the end of the season. Within the last few episodes, they managed to add multiple plot twists and and plot holes that do not make much sense. The ending is strung together so poorly that I was extremely dissatisfied by both the romance plot and main story plot. Aside from the descending plot line, the main focus is on makeup (teaching about different types, brands, and ways to use makeup to the viewers), so if you have no interest in makeup, you might not be interested in this story. Art (5/10): While this is not the ugliest or greatest animation style I've seen, it is decent and does not detract from watching the show. Most character designs are actually pretty good in my opinion. Sound (5/10): The opening and ending songs are quite nice to listen to. However, the sound effects are one of the most annoying aspects of the show. I was distracted by the sound effects many times while watching certain scenes. Character (5/10): The characters are not good. Many are one dimensional or seemingly change personalities or feelings quickly, without reason. Some even act in ways that do not make any sense, but you would have to watch the show to understand this. Some characters are introduced, only to never be mentioned again, while some characters are randomly interjected into the story and play significant parts. (Also, the male leads fall in love with the character based on her makeup applying skills, which ultimately leads to not very interesting character development). The only character with some type of interesting development is Jack, so I partly continued watching to see his outcome. Enjoyment (7/10): I enjoyed most of the episodes. I liked certain characters and mini plots in some episodes over other episodes. I thought the makeup aspect was also interesting. However, problems with plot, character development/personalities, and the unresolved ending decreased my enjoyment by a lot in the end. Overall (6/10): If you have free time and don't want to watch a really intense show, I recommend watching SSZN. Because the first half of the season is definitely better than the latter half, I suggest trying a few episodes out before deciding to watch it all. If you don't like the first few episodes, I suggest stopping and watching something else.